Large or small, casual cottage style to formal, designing an English herb garden is a creative and useful way to incorporate the fresh herbs you love to use in cooking. Growing an English herb garden was a common practice at one time. Placed near the house for use as culinary additions and medicinal purposes, the English herb garden is once again attaining a level of popularity. Although you can adjust and incorporate herbs you use most frequently, there are a few traditional English herb plants that are must haves when growing English herb gardens. Sweet basil is an annual that grows to about 18 inches and thrives in full sun. Borage attracts bees to pollinate all the herbs and annuals. This annual also enjoys full sun, is hardy and grows to about 2 feet in height. Another popular herb for English gardens, chamomile has white flowers and is used for medicinal and culinary purposes, not to mention it makes a wonderful cup of tea, and is an ideal herb for inclusion in your English garden. Chives are perennials that grow from 1 to 2 feet in sun to partial sun. The leaves and flowers are edible and the herb is basically maintenance-free. Dill is also a nice herb to include in the garden and will grow well, as most herbs, in a sunny spot. Lemon balm is a definite must have for growing an English herb garden; again, it makes delicious tea as well as having culinary and medicinal uses. 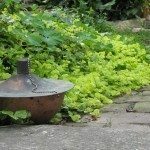 This herb has a tendency to take over the garden in either sunny or partial shade locations, so keeping it in bounds within a container is helpful. Mint is another plant that should be included in the English garden. It is a perennial and varies in size; however, like lemon balm it tends to overtake the garden if left unchecked. Again, growing in a pot helps with this. Two other perennials, oregano and sage, would make terrific additions to the English herb garden. Both can grow up to 2 feet in height and thrive in sun and well draining soil. English herb gardens can be small or grandiose with an inclusion of statuary, fountains, trellises, paths, and sundials. First and foremost, choose a site that gets at least half a day of sun. Measure the space and map it out on graph paper. Pick a shape such as a circle or ellipse or a classic knot garden. Sketch in quadrants within the shape which you have selected and border them with paths bordered by small shrubs. Paths are an essential element in the design of an English herb garden and allow for ease of maintenance and harvest as well as adding some élan to the garden. 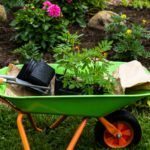 Paths should be wide enough for a wheelbarrow and should be laid with pavers, flagstone or gravel. Space the perennial plants around the bed clockwise, but at the center or rear of each section in a formal design. Fill in between perennials and the border shrubs with annual herbs and flowers. You may want to set some herbs in decorative pots to control rapid growers such as mint. Keep in mind that a classic knot garden requires vigilant pruning to maintain its shape. The English herb garden has a definite style, but don’t let it thwart your creativity. Use different materials for paths, varieties of herbs, and colors and texture of annuals to create a thing of beauty. The addition of yard accessories allows you to dress up the garden to reflect your personality as well. Choosing a focal accessory, such as a bird bath or statue, is a traditional English garden attribute. Get creative with the nature of the statue and make the English garden your own.